Every so often I switch computers or reinstall my OS and end up searching around the web for the exact steps to get everything working again. Today, as I set up my OS again, I figured I might as well document the process. Since Linux Mint is based on Ubuntu, I think that these steps (at least most of them) should work for Ubuntu users as well. 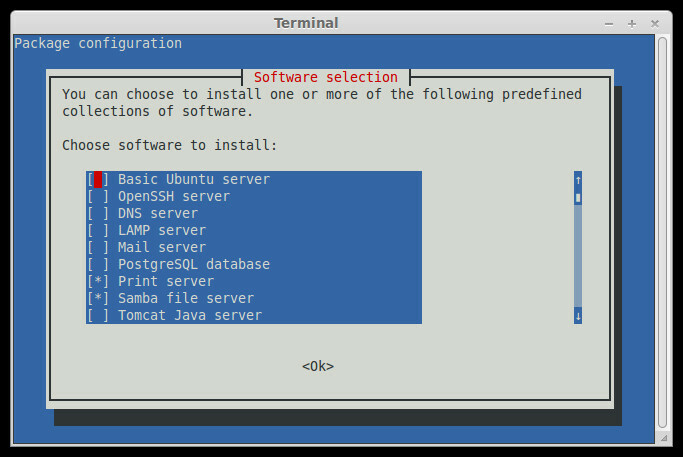 There are plenty of tutorials around the web explaining exactly how to install Linux. Today I’m going to skip straight to the steps I take immediately after the OS installation in order to turn Linux into a tool for web development. This will bring up a selection dialog within the terminal that will let us easily add additional functionality to our OS. In this case, we want to use the arrow keys to navigate to the LAMP server option and press the space bar to select it. After this we can hit enter and tasksel will go about installing most of the pieces we need. Part way through the installation process, we will be prompted to create a password for the MySQL root user, but other than the, the process is all automated. Just to make things easier, at this point I like to go and change the permissions of the /var/www/ folder (localhost). I set my normal/default user as the owner so that I don’t have to switch users when adding/editing files on the server. This will lead to a few more dialogs. The first will ask which sever we’re using, and we can select apache2. Next we will be asked if we want to configure the dabase for phpmyadmin with dbconfig-common. I have always selected the default value “yes” because I don’t have any reason not to. Next, we will be asked to enter some passwords. I don’t remember the exact wording of the prompts but entering the same password we entered in step 2 will work. Once this process is complete, phpmyadmin should be accessible by going to http://localhost/phpmyadmin/ in our browser. There are a few different ways to make these changes, but I typically just open the file manager as the root user, navigate to the /var folder, right click the /html folder, and change the owner and group permissions to my default user. Next, I typically bookmark the /html folder in my file manager and my browser, naming them both “localhost” for future reference. There are a number of PHP settings that are a little too throttled, in my opinion. For example, maximum upload sizes and maximum execution time. Rather then document it all here, I’m just going to link to a tutorial that shows how to easily change these PHP settings in Ubuntu/Mint. Installing WordPress is almost always one of the first things I do. Having WordPress installed makes it easy to test whether mod_rewrite is working properly, which is covered in the next step. The mod_rewrite module is what allows things like “pretty permalinks” in WordPress to work properly. For some reason, getting it working with Ubuntu/Mint is trickier than it should be. In fact, I’ve run into this issue so many times that I’ve already covered it in a different post. This does not install Grunt itself. The grunt-cli package simply adds the grunt command to the system path so that it can be run from any directory. Grunt itself must be installed locally within each project where it is used. For more details on installing Grunt, I would recommend reading this post on installing Grunt by Stephen Harris. If you’ve purchased a license, click Help > Enter License in the menu and past your license key in the input box. That’s it! 13. Now Get Back to Work! So that’s how I set up my local development environment. I left out IDEs/code editors because almost everyone has their own preference and if you have a preference, you probably already know how to install it. I personally use Sublime Text, but like I said, that’s personal preference. I also use VirtualBox to install virtual copies of Windows for testing various browsers, but that’s outside of the scope of this article. Is there anything else you do to get your local development environment up and running? If so, I’d love to hear about it! PHP GD: A PHP library for working with images. Virtualbox: Virtualization software to enable testing in Windows-only browsers. This is great, but after I install phpmyadmin, the localhost/phpmyadmin link just gives me a 404. apache is running fine and phpmyadmin IS installed but i can’t figure out how to open it. Sweet! I’m glad you got it figured out. Thanks for posting the link that helped you. Had to install SQL manually before installing PHPmyadmin. Then got the 404 error Thanks@Sten for the link. Thanks Tony! This tutorial is a few years old, so I appreciate you mentioning those changes that have been implemented since the tutorial was written.